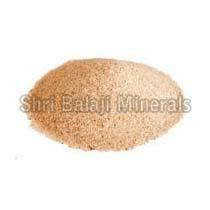 Our company offers dust free Boiler Sand (Bed Material) for various F.B.C operations. Being dry, the carry over of our boiler sand is minimum, because we offer correct sizing of bed material. The top quality boiler sand offered by our company is widely used in the boilers, which are operating husk, coal and pet coke. Size : The boiler sand bed material offered by us is available in 4 sizes as per the size/capacity of the Boiler. We also consider specific requirement of the client. Tested Quality : Our quality is constant and is available around the year. It is tested quality since a period of more than 10 years of continuous supplies in Punjab, U.P., M.P., Uttranchal, Rajasthan etc. For Husk : 0.5mm to 1.5mm. For Coal : 1.0 mm to 2.0mm. For Pet Coke : 2.0mm to 3.0mm.